So when it comes to making predictions for 2017, we go along with the physicist, Niels Bohr: “Prediction is very difficult, especially if it’s about the future.” It can also create ill feeling as in the story of what happened to the past , the present, and the future when they walked into a bar – it was pretty tense!! Despite that, we all like to engage in speculation about future trends. A small day spa like Coco Beauty Bar in the west end of Toronto doesn’t have the data of Google to draw on. But we do have eyes and ears and we can see what is in and what is out with our clients. So in that spirit, we offer our 2017 predictions. The Dewy, Luminous Look This trend started around summer 2015 and its booming right now. Although there are many makeup products promoting this look, Coco predicts that in 2017 it will be achieved through actual skin treatments and home care. Micellar water is going to continue to grow in popularity. That’s the cleansing water that many experts argue is better for your skin than regular soap and water. Natural skin care treatments As environmental concerns become more prominent along with the desire to live a more natural lifestyle, Coco has noticed an increasing interest in eco-friendly brands that contain handmade organic ingredients. Dry brushing of skin is also becoming increasingly popular. Read more about it here brushing skin? Lash Extensions: Totalbeauty.com declared RIP for lash extensions in their 2016 predictions. On the other hand, it was “the trend that keeps growing” according to the New York Institute of Beauty (Nov. 2016). At Coco, we have noticed that women aren’t just getting them for special occasions but are using them for every day wear. We have seen an ongoing high demand for Volume Lashes, aka Russian volume, and Ombre. (Ombre means light colour at the tip of the lashes gradually blending into a darker colour toward the lid). Volume Lashes are already extremely popular in Europe. We predict that Ombre Volume Lashes will be “the thing” in Canada in 2017. The most popular are Blue and Purple Ombre. The effect is subtle, can be seen under natural lighting and is very complimentary to the colour of your eyes. Microblading aka Feather Brows aka Permanent Makeup Long time practised in Asia, this only started in North America in late 2015 early 2016. Arched and fully polished brows started to get popular. This has led to a boom in Microblading or Embroidery /Feather/ 3D / HD eyebows. It’s not just women – men are also getting the benefit from it. Unlike in 2016 where the brows are either bold, highly arched or straight Korean style, we foresee 2017 as being the year of round or naturally enhanced brows from microblading. 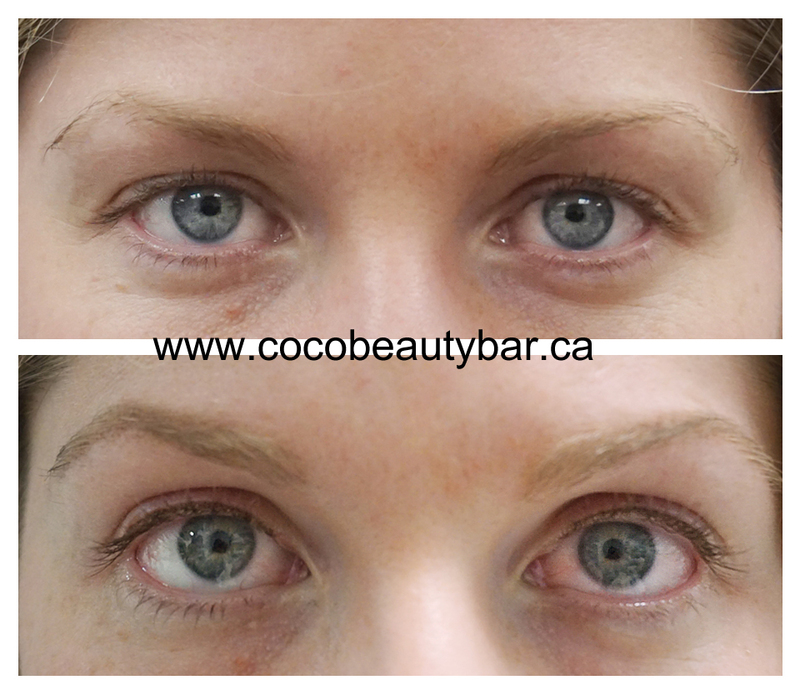 In the photo, the top image shows before microblading and the lower one shows after the procedure. SHAPE and LENGTH: Natural is in. Dump the fakes. Forget square shaped. Go oval or almond-shaped. We recommend having cute, slick, round nails. The nail plate should not have protruding parts and should look gentle, receding and as naturally looking as possible. Go short rather than long. It might not look so extravagant but you can make up for it with bright colour or impressive strokes. With such a combination, even a subdued design for everyday short nails can give the look of a fancy dressy manicure. But do not forget that the new season does not reject the long nails that visually lengthen feminine fingers and make them more elegant. Here it is important to choose design widely. As we have found, the square shape is not in vogue now and the same applies to too long stilettos and other sharp shapes. Choose only quiet, sensitive and plain lines. COLOUR: When it comes to colour, everything (almost) is permissible. Here at Coco, we love all shades of red, black, and of course chrome (ABOVE) is the big trend for 2017! Get the mirrored, hologram look! Another look for 2017 is the Ombre look (ABOVE) where, similar to Ombre lashes, a light colour on the top part of the nail gradually blends into a darker colour toward the tip.